Bike Incident '09 is OVER! I am not really good with bikes. I mean, I can usually navigate them from point A to point B and I generally get on with them well enough as long as I don't have to do anything mechanical. Maybe it's that I'm not really a mechanical person. But I think the bigger issue is bikes. Case Study A: It took me forever to learn how to ride. Or at least, that's the way I remember it. Like any young tot, I excelled when there were three or four wheels in contact with the ground (tricycles and training wheels respectively). However, when it was time for the superfluous wheels to come off, I found them rather...necessary. I fell a LOT. And I was learning how to ride on a gravel driveway. So...OUCH. Case Study B: For my...11th, I think...birthday I specifically stated that I wanted anything EXCEPT for a bike. So of course my gift was going to the store and picking out a bicycle and a helmet. It turned out well enough, I had that fancy mountain bike for years even after downgrading to a used street bike. On the other hand, while living in Madison, bike number two was stolen piece by piece. C'est la guerre (the bike guerre anyway). Case Study C: In lieu of replacing a broken pedal on bike three (aforementioned used street bike, belonged to my mom when she was young so it was "vintage" - read OLD) I opted to get around town hoping my foot wouldn't slip off the pedal post. And later, when taken to a bike shop to repair the broken brakes yet again, I was summarily informed the mechanic could spend a whole day working on the bike and still have plenty of repairs left. Whatever, just because a bike HAS gears doesn't mean you have to USE them. So, the spring after moving to Chicago I finally bought a new used bike. And I love that bike. We've been through some tough times, like when I had to pay $100 to replace a stolen wheel, but we've forged on. Until I locked it to the porch this winter. Not really a smart idea, actually. Given that it's the Midwest and therefore snowy and given that the porch is outside I didn't really put any forethought into "what if the lock rusts shut?" Which it did. I tried everything to remedy the situation (after discovering it two months later). It's been an epic battle. I called several bike shops for suggestions and got nowhere so I started improvising. Over the course of several weeks I tried bike chain lube then some charcoal stuff and finally I soaked everything with repeated dousings from a bottle of WD-40. All for naught. I was getting desperate. The sun was beautiful and I no longer wanted to walk everywhere. Yesterday I gave up on the thought of salvaging the locks (I was using a combination of U-lock and steel cable to secure the bike) and went to buy a hacksaw. After explaining the situation to the clerk, I was informed that a hacksaw would snap under the pressure (kind of like what I was about to do). Alack. Also, as I explained the situation the clerk treated me more and more like an incompetent, would-be bike thief. Which I resent, given that only the first half of that is true. So anyway, with no further options, I turned to Google. Why was that not my first thought? 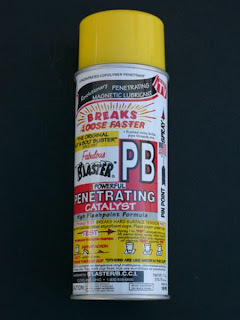 Google taught me the wonder that is PB Penetrating Catalyst. This stuff is AMAZING. I went to the nearby auto-shop this morning and bought a can. Within half an hour I had the bike unlocked, easy-peasy. *Seriously though, this is the best rust remover ever. EVER.